Manila—(PHStocks)—Philippine stocks closed this week’s trading on a lower note amid weak trading. The mainboard Philippine Stock Exchange (PSE) index slid by 0.26% or 16.56 points to close at 6,404.23 – improving from its performance in the early session, wherein it dropped by as much as 49.94 points to the 6300 level. 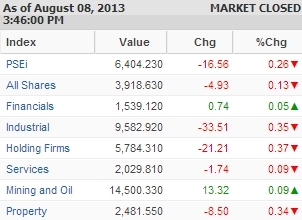 Except for the Financials (+0.05%) and Mining and Oil (+0.09%) indexes, all the counters were down but minimally. The biggest losing segment – Holding Firms – declined by just 0.37%. Following that is the Industrials, which slid by 0.35%, and the Property sector, which declined by 0.34%. The All Shares index dropped by just 0.13%. Trading was weak. Value turnover reached only PhP4.19 billion on 686 million shares traded. Foreign buying reached PhP1.95 billion while foreign selling was Php2.7 billion. There were 63 gainers against 61 losers, while 57 stocks were flat. Today’s most active stocks include SM Investments Corporation (SM, PhP826.50, -2.30%), Ayala Land Inc. (ALI, PhP29.00, -0.17%), Universal Robina Corporation (URC, PhP117.00, -2.17%), Metropolitan Bank & Trust Company (MBT, PhP106.30, -0.19%), Philippine Long Distance Telephone Co. (TEL, PhP3,074.00, -0.32%), Globe Telecom Inc. (GLO, PhP1,602.00, +0.13%), Metro Pacific Investments Corporation (MPI, PhP5.10, +2.00%), Alliance Global Group Inc. (AGI, PhP26.1, +0.38%), SM Prime Holdings Inc. (SMPH, PhP16.58, -1.19%), and Cosco Capital Inc. (COSCO, PhP10.72, +0.37%).